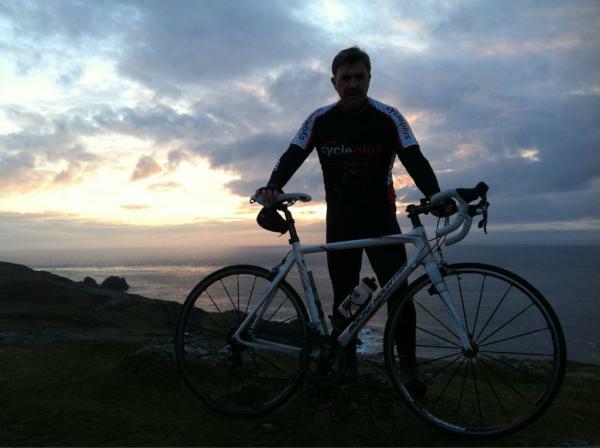 It was the final day of our marathon cycle from Mizen head to Malin. Five days of constant cycling, inclement weather and patchy sleep had certainly taken its toll on us all. In the same way a western child telling his mother that he is starving when compared to starving African child, to truly know the meaning of exhausted means having cycled non stop for four days and to look into the abyss of the fifth. 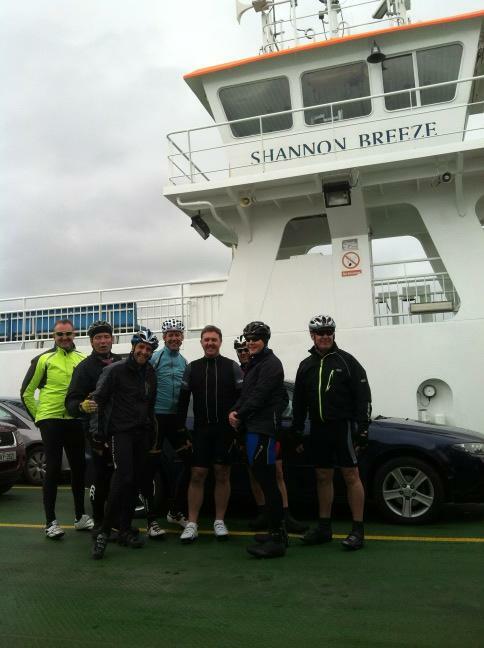 We rose early on the final day and set off from Ballyshannon facing into the last 155km. This should have been cause of some enlightenment, to be so close to the end, but as we edged out of the protected dip of Ballyshannon town and onto the main road, we met the full force of the weather. Overnight the weather had deteriorated to gale force winds, driving rain and freezing conditions. We could barely see the road and ahead and found it difficult to stay on our bikes let along travel forward. Within minutes we were soaked to the skin and being blown all over the place. Heads down we had to carry on regardless, our next stop was not for 50kms. We may have been together as a team, encouraging each other, motivating each other, but being on a bike is ultimately a solitary affair. Your team mates may slap you on the back, tell you ‘well done’ and race you to the next town, but no one can ride your bike for you. You can only do that alone. You can’t stop, can’t pass the baton, can’t rest for bit. You just have to keep pedalling. Those 50km may well have been the worst of our entire journey but there was no way we could stop until we reached Ballybofey. Once there we found refuge in a hotel and stripped off our gear and put them in the hotel’s drier. One person had mild hypothermia, the rest of us had lost the feelings in our fingers and toes. We warmed up encased in hotel towels and waited for the weather to ease up. Two hours later it was a little better, enough for us to get on the road again in our dry gear. It rained in pieces but nothing like the earlier onslaught. Next stop Letterkenny and then onto the comically called Muff which we reached at 6pm. Another coffee to warm our inside and we set off again. It is not physical conditions that threaten to scupper such endeavours, but physiological. The mere feat of putting ones leg over the bike and beginning to pedal, again. We were wet again, tired beyond normal comprehension and devoid of energy. 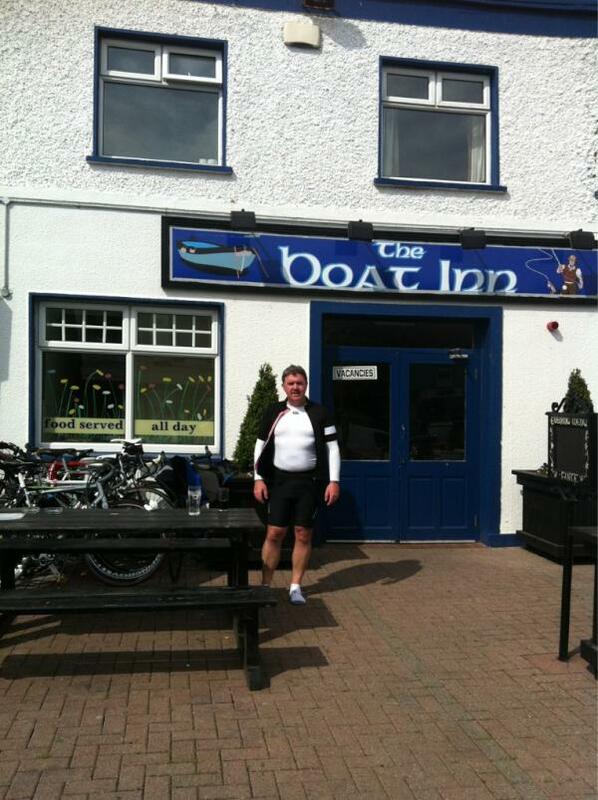 We reached Malin town and headed out the last 18km to Malin Head itself. The gods must have smiled upon us at that point as the rain eased, the clouds parted and the sun came out. The still waters reflected the patchy blue skies and we travelled on in silence but hope returning as we neared our goal. As we cornered the peninsula, we swallowed in fright. As if in a bad joke the final 400mters was as steep a climb as you might face. Out of the saddles we stood to pedal the final back breaking ascent to Malin Head. There at last, at 8:30pm, we cried, we laughed, we hugged each other, we stood in amazement. 750km in five days and often terrible weather, we could not believe it. .
Of course, mere mortals must still return to earth and we had to cycle 5km back to our hostel. The longest cycle perhaps as we wanted to be anywhere but on our bikes. I have learnt many things on these five days. I have pushed my body beyond that which I would have thought possible. I have faced my psychological demons and triumphed. I have seen beautiful parts ofIrelandthat might not otherwise be seen except on a bike and certainly overlooked if speeding past in a car. And I have learnt the next time I attempt anything like this again, I shall do so on a motorbike! The pain is etched on everyone’s face. We get up and our legs hurt, our muscles ache, we have aches were we never knew we even had muscles. This is our last day and we are all exhausted. Yesterday we had the longest day of the five days. 185km in total. It was such a long day that we knew we had to get out early and so at 7:30am we were on the road. Yesterday was a dry day but very cold with a north easterly wind. We left our hostel and enjoyed the first run down around Killary Harbour. The scenery was breath taking and we enjoyed the cycle down. It was early and we were starting to loosen up and while we knew we had a long day ahead of us, we felt bright. We passed Croagh Patrick, the scene of summer pilgrims in the early morning light, and stopped in Westport for a quick breakfast. With so many kilometres to cover today we didn’t want to stop for any longer than necessary. We didn’t really want to talk about how many kilometres we had to cover either, we just wanted to get on the road. When we finished our breakfast, the sun came out. A good omen. We set off again at a cracking pace, both in speed and the noise our weary bones were making, and headed for Castlebar and then onto Swinford. Briefly dipping into Sligo we had lunch at Tubbercurry but we didn’t stop long, heading through Sligo town instead and onto Drumcliff, the resting place of Yeats, for another quick pit stop. 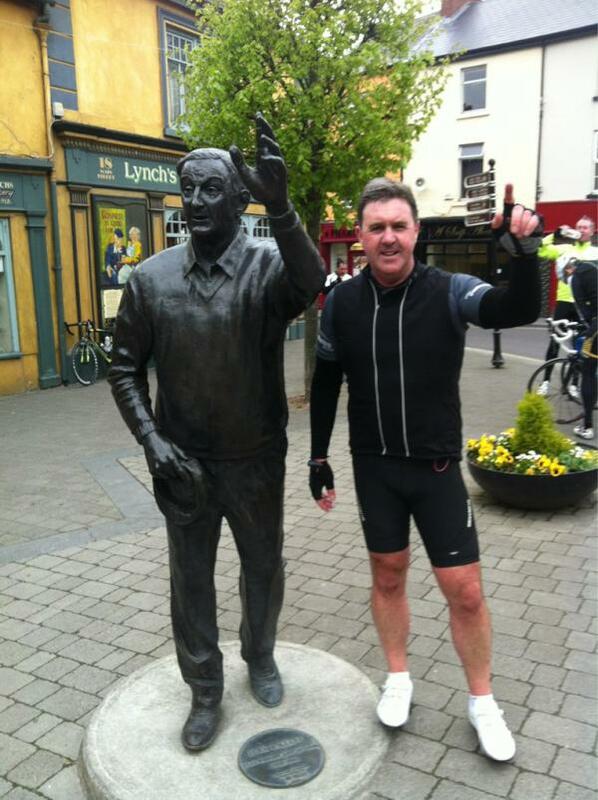 Then onto the final stage, Bundoran to Ballyshannon, which was completed at 7:30pm last night. All up, we were in the saddle for almost 12 hours non stop. Pain truly is our new best friend and don’t we know it, in spades. Today we have our final journey from Ballyshannon to Malin head. This is a route of some 145km which is long in itself. However, there are added complications is that we are travelling through the Donegal Mountains. This means we are facing some of the toughest climbs of the whole week at a time when we are at our most exhausted. Add into that creaking mix, heavy driving rain as we set off this morning. Pain may be our friend but rain is our enemy and rain at the beginning of the ride is the toughest. We shall just have to put our heads down and get cycling. Until later my friends when I very much hope to be able to report from Malin Head, our final destination. They say that pain is your friend. I don’t know exactly who they are but I’m not convinced. I have just arrived in Leenane and I am lying on the grass and I cannot move. Tomorrow is our hardest day to come and right now I don’t know how we can do any more than we did today. At this point I’m not even sure we can do the same as we did today. We cycled for ten hours today, pretty much full on. We went through Galway which was a mental milestone. To get north of Galway was really important, even though it was only a half way mark. Surprisingly, Galway was very busy with traffic and we found it difficult to move through the streets. Soon, we were back on the open road again and pushing against the wind. We cycled a total of 115km before lunch. Admittedly it was a late lunch around 3:30pm but 115km. If anyone had told me I’d be doing this, I might not have believed them. I still might not. Here I am at lunch looking very bewildered. 115km before lunch? How is that possible? I’m still here on the grass where I have dismounted from my bike because I don’t think I can move. My helmet is still on. My watch reads 156km today all in. I’m all in. And tomorrow is our hardest day. We face approximately 170km tomorrow, our penultimate day. I can’t even move here. I may just sleep here for a bit. Every bit of me aches. My aches have aches. ‘May the fourth be with you’ was the Star Wars cry across the world today, but for the ten men cycling from Killarney to Malin Head, it was more a question of ‘May the North East Wind be against you!’ While the rain held off thankfully we did spend most of the 135km facing into a tough head wind. For day two, this was certainly a tough start. The good news is that after a rather patchy and extremely short sleep the night before day one, last night we all slept like babies. So we had good spirits to face this tough day. We stopped first in Castleisland for a coffee and I met a local celebrity, Mr Keane. At Tarbert we caught the ferry to Kilrush, moving from Kerry to Clare. There is a lot of waiting around sometimes on cycles. Here we are on the ferry. 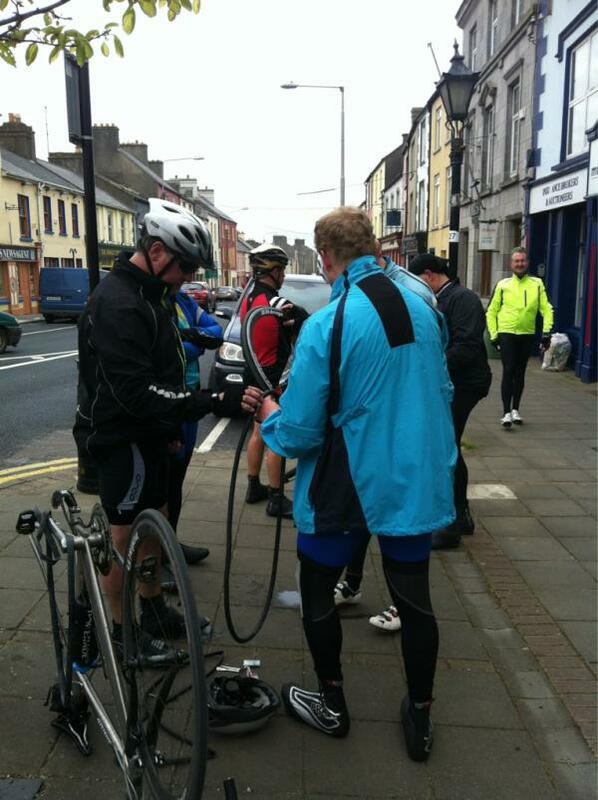 Once we landed in Kilrush, then we had to deal with a puncture. Fortunately with modern bikes and reasonably good roads, punctures are not major issues. We all helped to put the bike together again as you can see below! So puncture repaired off we set again. Next stop was Doonbeg, just 30k from our final destination. Here we stopped for some warm coffee. Wayne our trip mechanic had brought his guitar with him, not on his bike you understand, but in the support van driven by his girlfriend. It seemed a really friendly pub and we fancied a bit of craic and ceol, so out came the guitar (from the van) and we sang some good ballads. 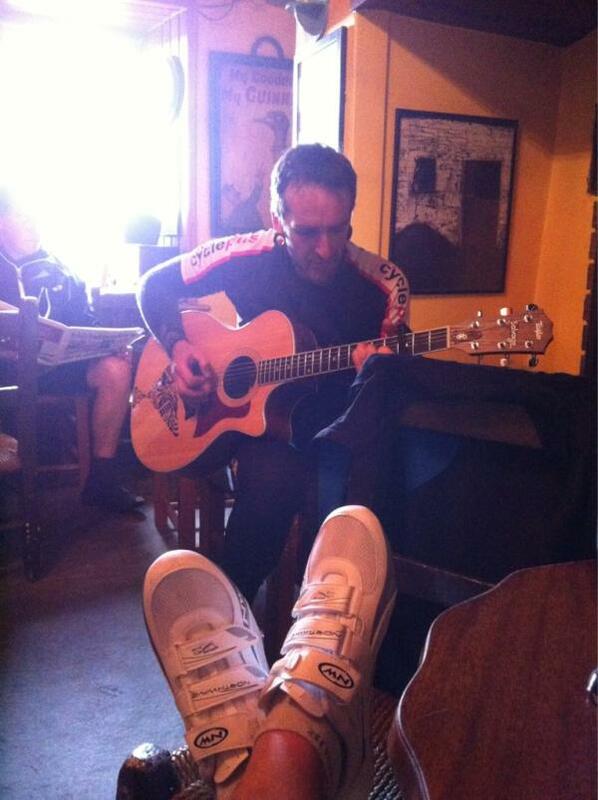 The locals looked aghast at men in lycra singing ballads but we had a great time. The landlady was impressed and gave us tea, coffee and biscuits on the house. We were singing for our supper! Day one was always going to be tough but it wasn’t helped by our late arrival at the lovely Barley Cove hotel in Mizen head. We arrived at 1:30am yesterday evening, or rather this morning, and were all in bed by 2am. However, the alarms rang early and we were up at 6:30am eager to get going. In order to make the journey authentic we cycled first back to the very tip of Mizen Head and posed for a photograph at the the start. It was only a short 3km cycle but we were already pretty wet. Then photograph taken for posterity, we set off on our first leg. 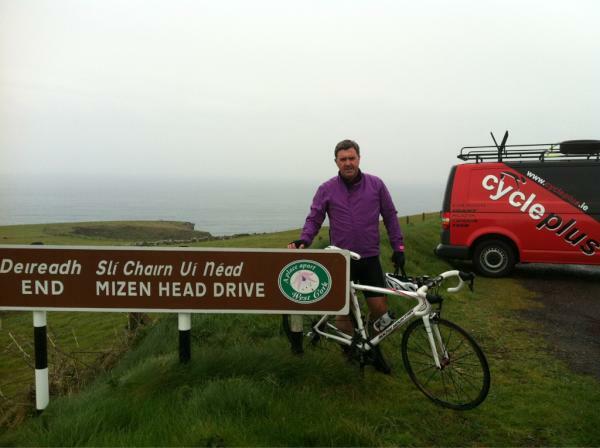 From Mizen Head to Kenmare it rained non stop. I am sure the views were spectacular but we didn’t get to see that much in the rain, fog and constant drizzle. We had a late lunch in Kenmare and tried to dry off a bit, not very successfully. From Kenmare we set off again, at least with our bellies full. There were two climbs on this leg of the journey, the first at Glengarrif and the second at Molls Gap, These were punishing climbs but the rain began to ease. 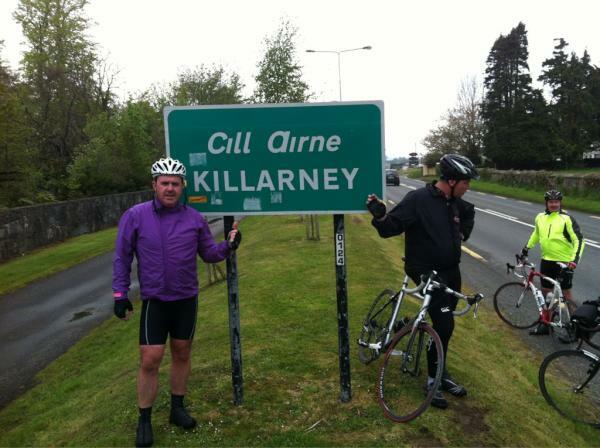 After Molls Gap, it was largely downhill to Killarney, a journey of some 20kms. The views were very beautiful and the scenery awe inspiring. The lakes were like reflective pools of light in the sunshine and we were almost able to drink them as we cycled downwards towards our first overnight stop in Killarney. I am now back at our hotel and about to get scrubbed up. We are a dirty, wet and scruffy bunch but we have big smiles on our faces. It was a very tough first day, 123km in tough weather conditions and some pretty hard climbs. But the last 20km and the views made up for the wet start. We are off for an early dinner and then I suspect an early night. There is another long day ahead of us. Thank you for sharing and reading. Seán Melly is a successful entrepreneur and investor in the telecommunications and technology sectors. He established TCL Telecom, one of the first competitors to the state monopoly, inIrelandin 1995. MCI WorldCom (now Verizon) acquired this business in 1997. He remained at MCI WorldCom following the purchase as Chief Executive Officer, Board Director and member of MCI WorldCom’s Pan-European Executive Team. In 1999 he founded eTel Group. He built eTel into the leading pan Central European competitive telecom operator. eTel was acquired by TelekomAustriain 2007. Melly is a member of the Board of the Trinity Foundation, Chairman of the Board of Trinity Business School and Professor of Finance (adjunct) on the MBA faculty at TrinityBusinessSchool. Since 2006, the Irish Hospice Foundation has been funding a Nurses for Night Care Service. We work with the Irish Cancer Society, who provide the extensive nursing service for people who are critically ill in their homes. The vast majority of people who have access to hospice services have cancer. We are concerned to ensure that similar quality care is also available to people with other illnesses – for example motor neurone disease, chronic kidney failure and advanced respiratory disease. The Nurses for Night Care Service means that patients with conditions other than cancer can access a night nursing service which allows them to remain at home during their last days and in some cases facilitates their choice to die at home. Night time can be a vulnerable time for patients and families, with few services available to them. This service maintains the continuity of care that the patient has experienced during the day, supported by the palliative home care team and surrounded by family. These nurses stay in the home throughout the night, providing nursing care, practical support and reassurance to both patient and family. The service is a very significant support in providing respite for families as they in turn care for their loved one at what can be a very difficult time. For many years there has been a high quality and responsive night nursing service in place for people with cancer, provided by the Irish Cancer Society. They generously allow us to access their highly trained network of nurses to provide the same service to patients with illnesses other than cancer who are being cared for at home during their last days. Based on 2011 figures the cost of one average night’s service is €323. In order to fund this service in 2012 we must raise more than €325,000.